This old Everly Brothers song written by Howard Greenfield and Carole King was the first cover version recorded by a-ha. The regular 7"-release features a group-shot (Pål, Mags & Morten). 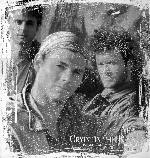 Seemingly the photo is covered by thin white film and the true colours of the shot and parts of the faces of the band members appear clearer through the large a-ha-logo printed across the mid-section of the sleeve. The title of the single is written in small black letters to the lower left, directly below the logo. The reverse reveals the actual photo on the front, but in a much smaller version (2"x2"). Additional information is printed in small black letters on a white background. The single includes LP Versions of "Crying In The Rain" and "(Seemingly) Nonstop July" preceding the release of the album "East Of The Sun West Of The Moon". There is a 7" "Limited Edition Hits E.P." available only in the UK which comes in a gatefold sleeve. The front cover is white with a large dark blue block a-ha-logo with "Limited Edition Hits E.P." written in red above. The tracks are written in red and blue at the bottom of the cover. Inside the sleeve there is a different 7" sized colour picture of a-ha in the forest and 3 individual pictures on a white background. The reverse of the sleeve is dark blue with a small colour group picture, the titles printed in light blue and additional information in white. The 12"-release has the additional LP Version of "Cry Wolf", but is otherwise identical to the edition on the smaller format. As the 12" release of "You Are The One" marked the end of the picture disc era, we have to be content with the regular 12" release from this point on. The 5" CD-single comes in a jewel case and has the same sleeve as the 7" only that down the left hand side of the front cover there is a white strip with "5-Inch-Compact Disc Maxi Single" written on it. The German made CD is silver coloured with black titles, "a-ha" and WB-logos. For the first time in the UK, the single was released on cassette single as well (not available in the rest of Europe). The cassette single has a similar front cover except that the picture and logo are rotated so that the logo is written down the left hand side. The title is written in black at the bottom right and "cassette single" in the top right. The inside and spine of the cassette insert are white with black titles. The cassette itself is black with titles printed in white and features the same tracks on both sides. The colours of the various formats come in slightly different shades ranging from the beige coloured 7" to the grey coloured cassette. 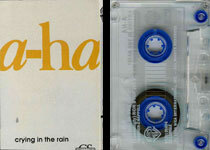 Australia: The Australian cassette has a white card sleeve with the a-ha logo in large yellow letters across the top. The title is printed in small black letters towards the bottom of the sleeve and there is a single grey teardrop above. The cassette is transparent with blue cogs and white titles. Brazil: The 12" promotional disc has the same track on both sides and features a totally different picture sleeve compared to its European counterparts. A circular light blue and black band-shot (identical to the one featured on the "Stay On These Roads"-picture disc), with 'burnt' looking edges is placed on a lemon-coloured background. 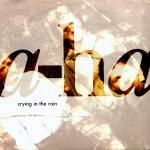 The black a-ha-logo with light grey edges is placed directly above the picture, while "Crying In The Rain" is written in black letters directly below it. The reverse is also lemon-coloured and offers a white-framed light blue and black 9"x9" photo of the band members playing guitars. A black and light grey a-ha-logo is printed above the band-shot while additional information is printed in small black letters within the 9"x9"-square. An additional feature of this disc is that the a-side plays at 33 RPM, while the flip plays at 45 RPM. Hong Kong: There is an extremely rare 12" promotional release which comes in a unique picture sleeve and is one sided. The sleeve of this release features a black and white group shot (Pål, Morten & Mags). The actual cover looks like someone has painted round the outside with some white paint in a haphazard fashion while the rest of the sleeve has some speckles of `white paint'. The title (which has been incorrectly printed as "Cryin' In The Rain") and other text are printed in white letters in the bottom right hand corner of the sleeve. This record doesn't seem to have a catalogue number. The reverse of the sleeve is mainly covered with a grey black pattern with white 'paint splash' effect around the edge. The title (also incorrect!) and other text is printed in white in the bottom right hand corner. Italy: There is a juke box white label promo 7" which features The Obvious Child by Paul Simon on one side and Crying In The Rain by a-ha on the other. It doesn't come in a picture sleeve. Japan: The Japanese 3" CD comes in a snap-pack and has a different cover to the UK release. The top half is white with two small colour band pictures on the right-hand side and a large light brown a-ha-logo down the left-hand side. The title is written in dark brown letters down the middle between the logo and the pictures. The bottom half of the sleeve is white with blue a-ha-logo and Japanese text on the right-side and the brand name "Gatsby" written just below the centre. The reverse of the snap-pack has lyrics in English and Japanese. The CD is silver coloured with a red WB-logo and black text. Promo editions of the CD have "SAMPLE NOT FOR SALE" printed in red letters around the centre of the disc and a white promo sticker with red text stuck over the barcode on the back sleeve. Mexico: The Mexican promo of "Crying In The Rain" comes in a unique picture sleeve with a black and white shot of the band (Paul, Magne, Morten) in the woods. The a-ha logo is printed in orange in the top right hand corner. The title is printed in Spanish in orange in the bottom left of the sleeve ("Llorando En La Lluvia"). The back of the sleeve is white with a large picture of the album cover in the centre top of the sleeve. The title is in orange underneath with other titles in black. The same track is featured on both sides of the disc. 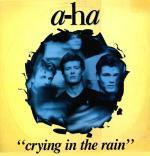 USA: The US 5" 1-track promotional CD-single for "Crying In The Rain" comes without a regular disc-sleeve insert. However, there is a Warner Brothers backing insert. The a-ha-logo plus information about the track is printed in black letters, while "Promotion Only - Not For Sale" is printed in black letters on a beige background in the upper right hand corner. The spine is also beige, while information here is printed in black. The actual disc is silver coloured with black titles. There is also another US promo 5" CD which features the 3:57 "Radio Edit" of "Crying In The Rain" - this version seems to be similar to the regular version but without the intro. The US cassette differs slightly from the UK release. Firstly, it comes in the usual US style card sleeve into which the cassette slides. The cover design is similar to the UK edition except that "cassette single" is written in a single line rather than in two and the font used is smaller. The spine is brown with "a-ha" and "crying in the rain" in white letters plus the catalogue number, WB logo and CS single logo in orange. The reverse of the sleeve is brown with "crying in the rain", "(seemingly) nonstop july" and the WB logo in orange plus additional white text. The cassette itself is black with white text. One song has been recorded on each side of the cassette. 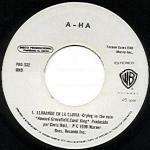 France Crying In The Rain (LP Version) // (Seemingly) Non-stop July (LP Version) / Cry Wolf (LP Version) 7599-21768-0 ?